3.30am wake up calls to meet an early flight are never much fun. Arriving at Launceston, despite my excitement at the four days hiking that lay ahead, I’m unusually weary and keen flop onto a bed for a power nap. 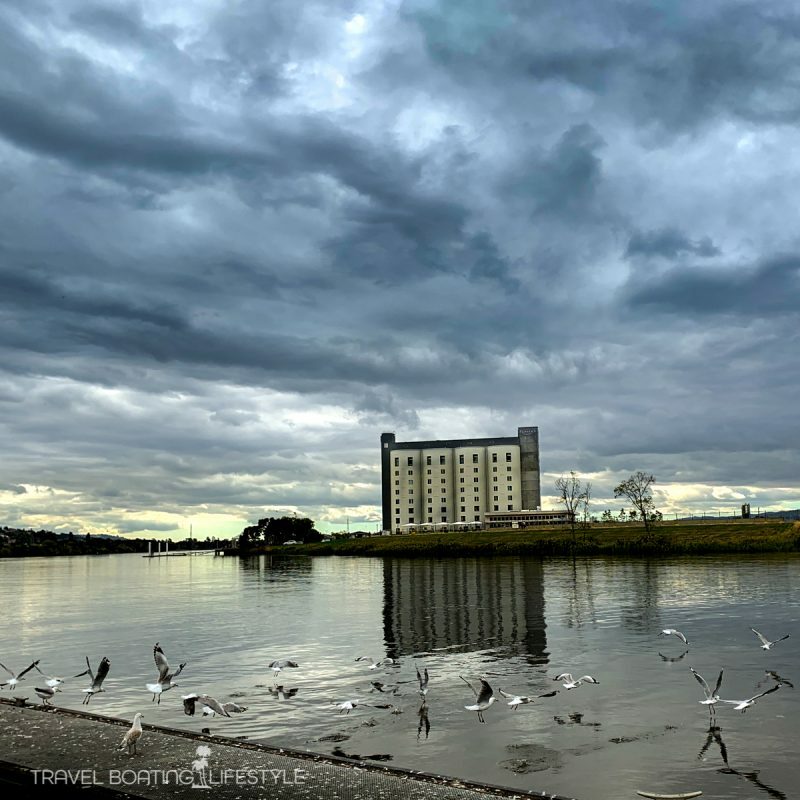 But my smile is immediately restored upon stepping out of the elevator on level one at Peppers Silo Hotel Launceston. There to greet me, tail wagging enthusiastically and eyes alight with joy at the prospect of a new fan, is an adorable dog called Archie. A hotel hound at the top of his game when I arrive, I sink onto my knees and offer the first of many cuddles, pats and scratches under the chin. Obligingly, he rolls onto the floor himself and offers his belly for a proper rub. “Oh yeah, that’s more like it,” he seems to say as his eyes roll back. Archie is an old hand at this sort of thing. Since the hotel opened less than a year ago he’s seen this sort of behavior from guests hundreds of times already. This is what he was trained for. Admittedly, after two years in Guide Dog School he’s a little over-trained as Chief Meeter & Greeter, but no matter, he applies himself to the task with gusto. Truth be known, Archie only has one job. He’s tasked with putting a smile on guest’s faces when they arrive. Seriously. That is his job. 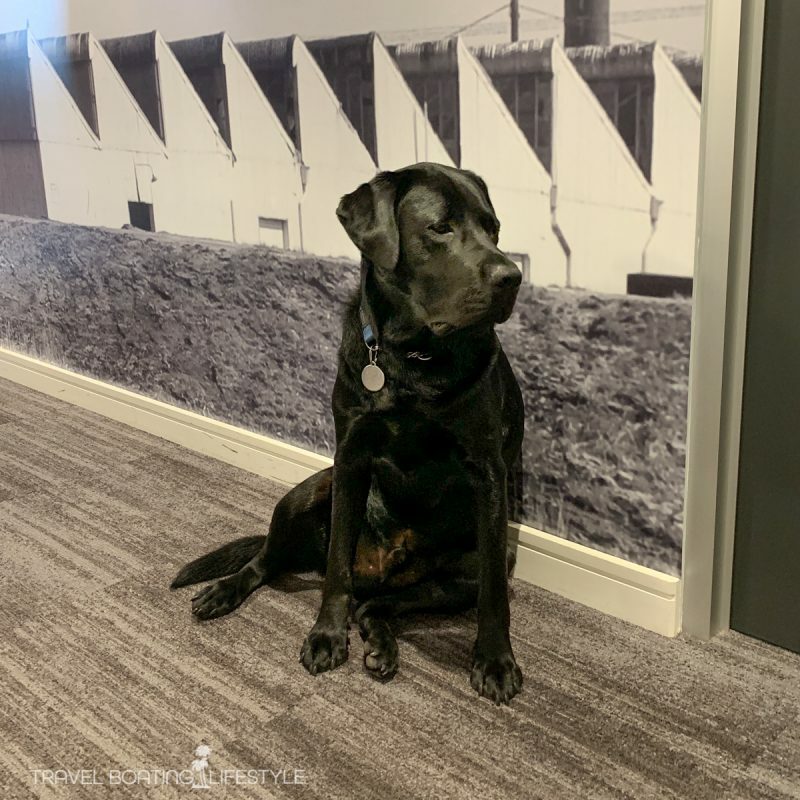 Archie is a four-year-old black Labrador who lives and breathes hotel life. He has two day beds to choose from in the main lobby, but he also has a ‘secret bed’ behind the front desk where he retires to when he needs a break from the pressures of ‘being on’ all the time. Finding himself a gig at Peppers Silo Hotel is probably not as arduous as the role Archie was originally destined for. 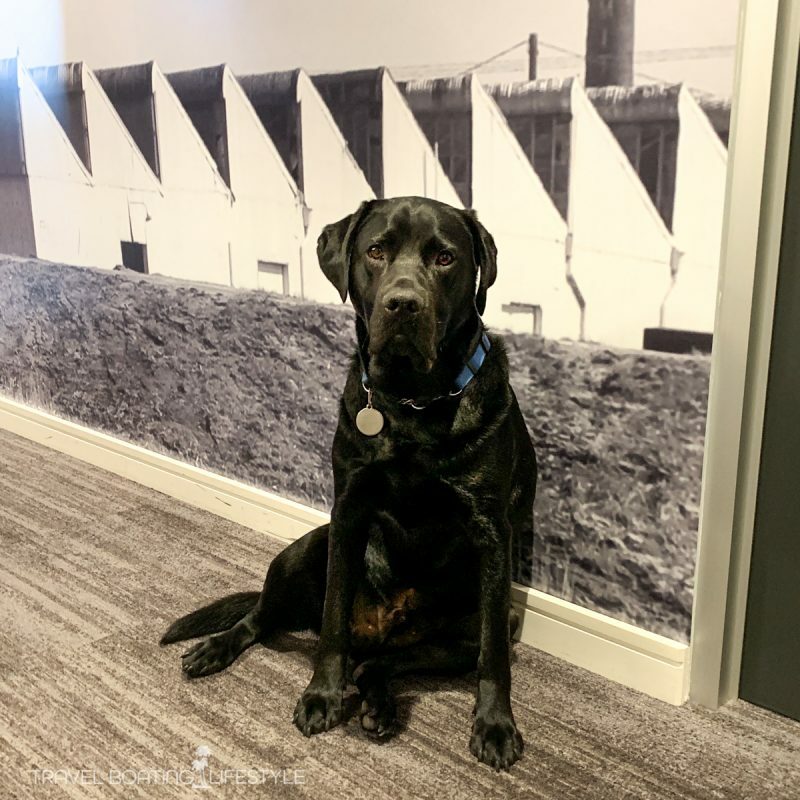 After two years training in Guide Dog School, it was determined that Archie was a “little too enthusiastic to make the final cut.” He was recommissioned to be a companion dog instead and was promptly snapped up by Management at Peppers Silo Hotel. A lesser hound may have wallowed in the shame of dropping out of Guide Dog School. But not Archie, he’s a real go-getter. 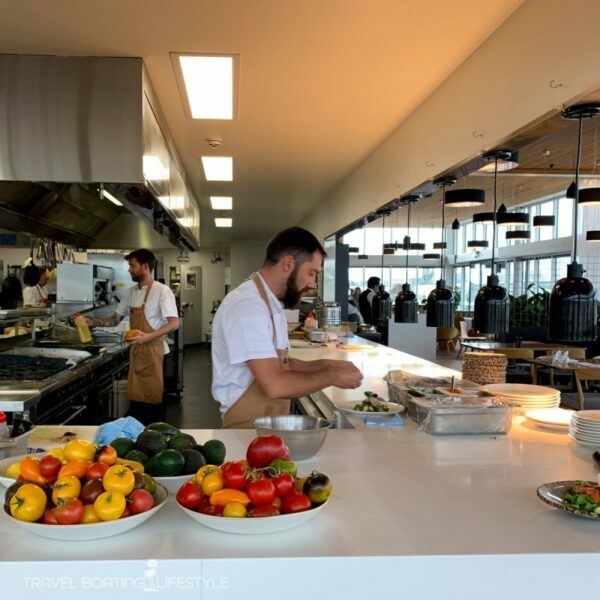 Finding himself unexpectedly in the hospitality game he’s turned his life around and is well on his way to serious Insta-Fame. As Archie returns to his bed, having done his job, check in is swift and efficient and I’m soon ascending the elevator to level 5, not least because I have no bags to wrestle thanks to Virgin Australia’s baggage handlers having ‘misplacing’ my luggage. Long dilapidated, deserted and derelict, the heritage silos on the banks of the Tamar River date back to the 1960’s when the 35m tall building was used for grain storage in four silos. Ships docked at Kings Wharf to load and unload cargo, of which grain was an important component. 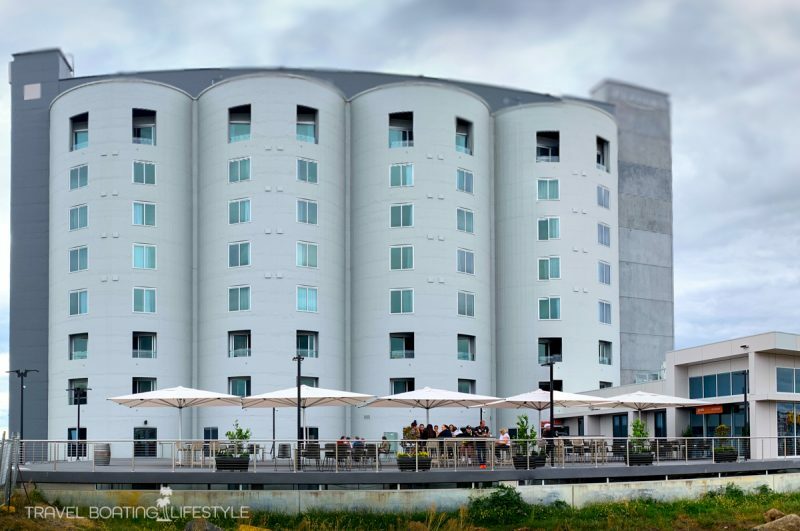 The silos have since been converted into a sophisticated nine-level hotel which opened in June 2018 with many rooms housed within the original concrete silo structure. With 108 hotel rooms, 50 of them are sited within the barrel of the old silos, their original concrete walls a beguiling historic contrast to luxuriously appointed rooms. My room: (#512) A Gorge River Deluxe Room located on level five of the Silo Building. One curved wall, the former interior wall of the silo, is left in its raw concrete state. I love the pleasing curves but so too the evident history in every concrete pore. Contrasting with the semi-industrial feel this wall lends, the room is plushly carpeted with a king bed dominating the large room. A floor to ceiling window faces south towards Cataract Gorge with sweeping Tamar River views. Splendid: Big comfy king size bed with crisp linen and not too many pillows to be discarded before I climb in. Bedside lighting iss easy to figure out – it’s always a bonus when I don’t have to ring down to the front desk to find out how to darken the room! 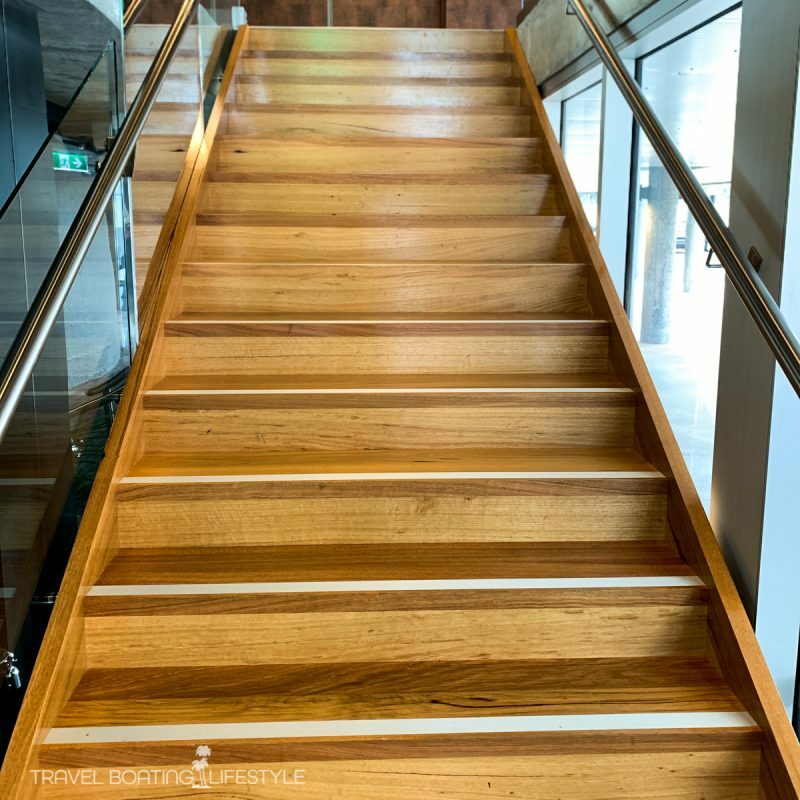 Across the hotel recycled timber from the old silos and adjacent docks has been restored to its former glory. 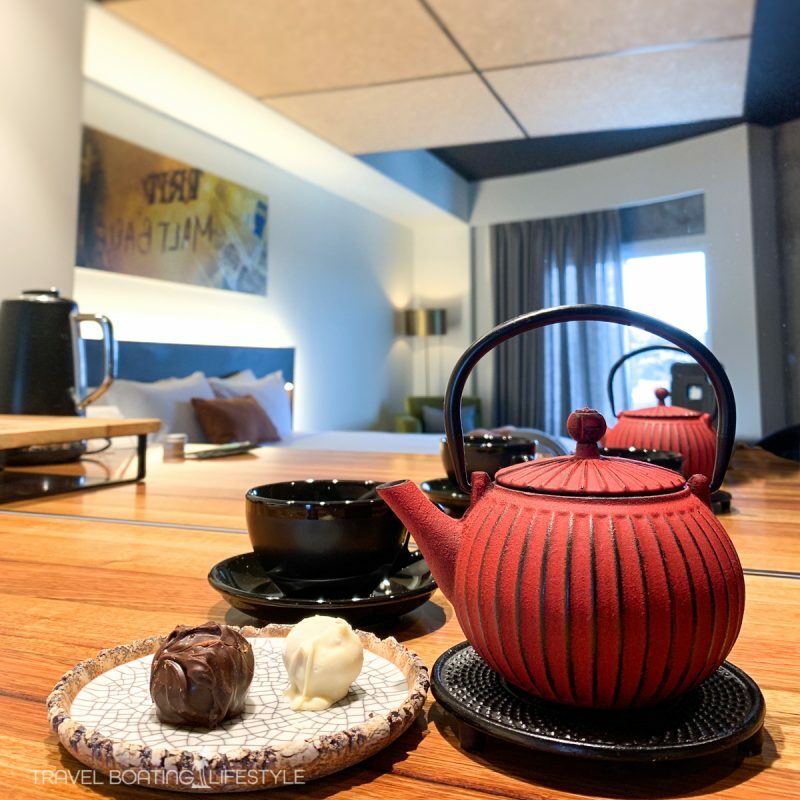 The mini bar recess has a gorgeous Tasmanian oak top and is home to an equally delightful teapot and some delicious Tasmanian truffles as a welcome gift. There’s good lighting, a large mirror to reflect the view and some handy powerpoints. A large workspace is also made from recycled timber and has well located power points as well as USB points built in beneath the flat screen TV – nice one! I adore the lounging sofa near the window and the first thing I do is make a cup of tea and sit back and watch Launceston from five floors up. Adequate: Walking into a room when the TV is turned on is a turn off for me personally. Oh, I know hotels use the screen as a form of welcome, but the first thing I do is find the off switch, never to be turned on again while I’m in residence. Splendid: Bright lighting, avast wall to wall mirror and vanity, step through shower with rain-shower head, toilet and a full length mirror behind the door. One curved wall of raw concrete pays homage again to the buildings history. In the late afternoon there’s quite a crowd building at Woodies Bar when I return from a walk around the river. 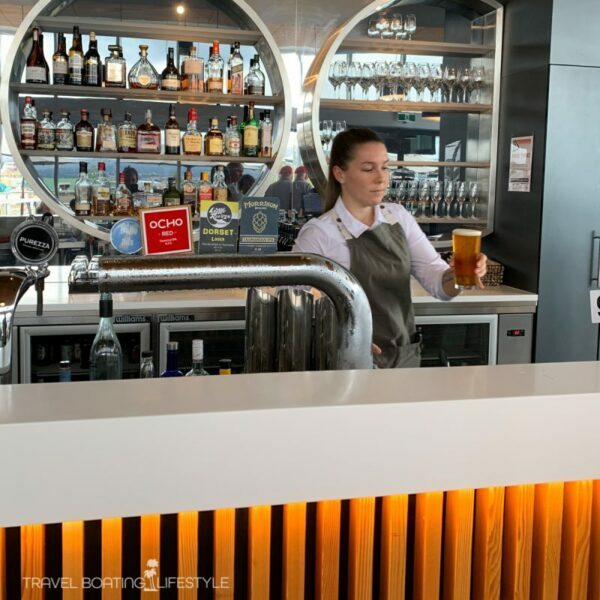 The barman offers a platter steaming with party pies and sausage rolls, which seems an odd bar snack until he mentions that ‘there’s a game on and we welcome the pre-game crowd walking to the ground. 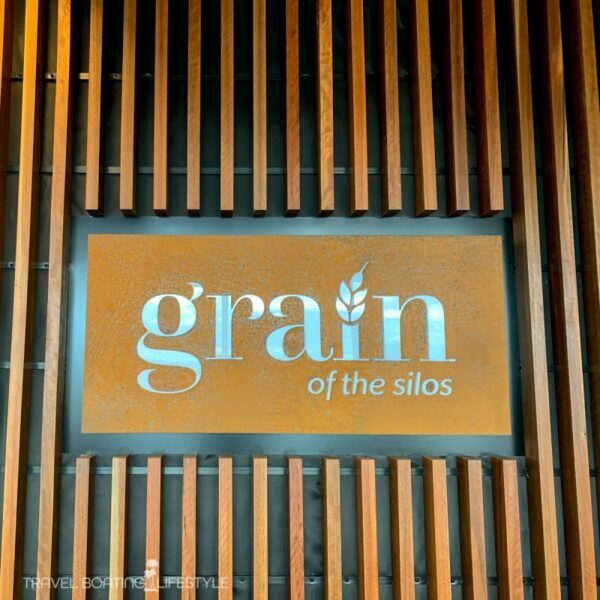 Grain of the Silos Restaurant is on level one and promises the sort of paddock to plate dining that Tasmania has perfected. I’m not disappointed. I start with a cos heart salad rich with avocado and pickled cucumber which satisfies my salad craving. 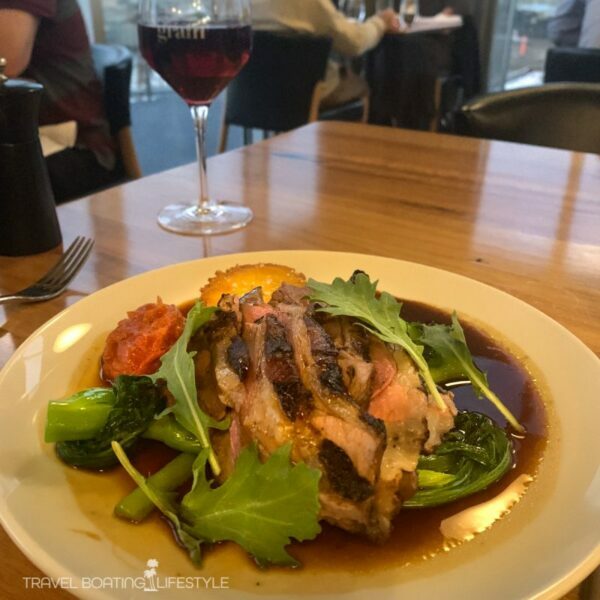 For main course I can’t decide between crispy skinned ocean trout or grilled Flinders Island lamb – the lamb wins out and goes perfectly with a Ninth Island Pinot Noir. Service is impeccable. There’s also a health spa and well-equipped gym at Peppers Silo, neither of which I have time to enjoy unfortunately. Couples will love: Walk in showers big enough for two as well as a window seat for watching the world go by. 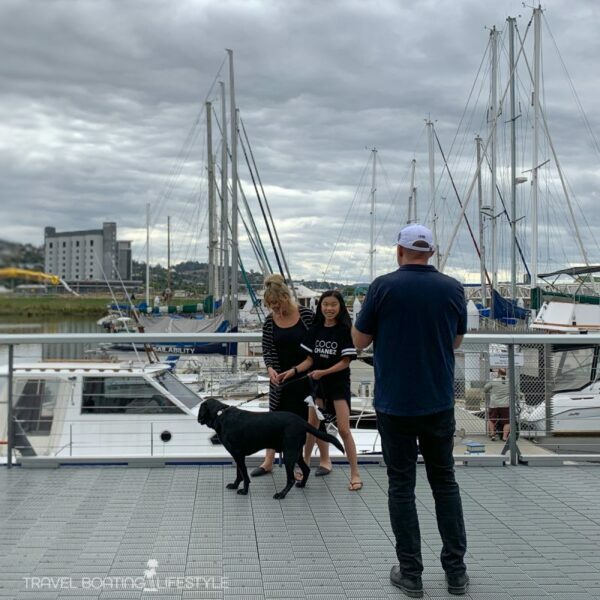 Families will love: Hotel hound Archie is the star attraction for families (actually for couples and singles too) – take him for a walk, play in the park or take him up to your room for a play date with the kids! NOTE: The area surrounding the hotel is undergoing major redevelopment as a leisure playground and park are under construction. 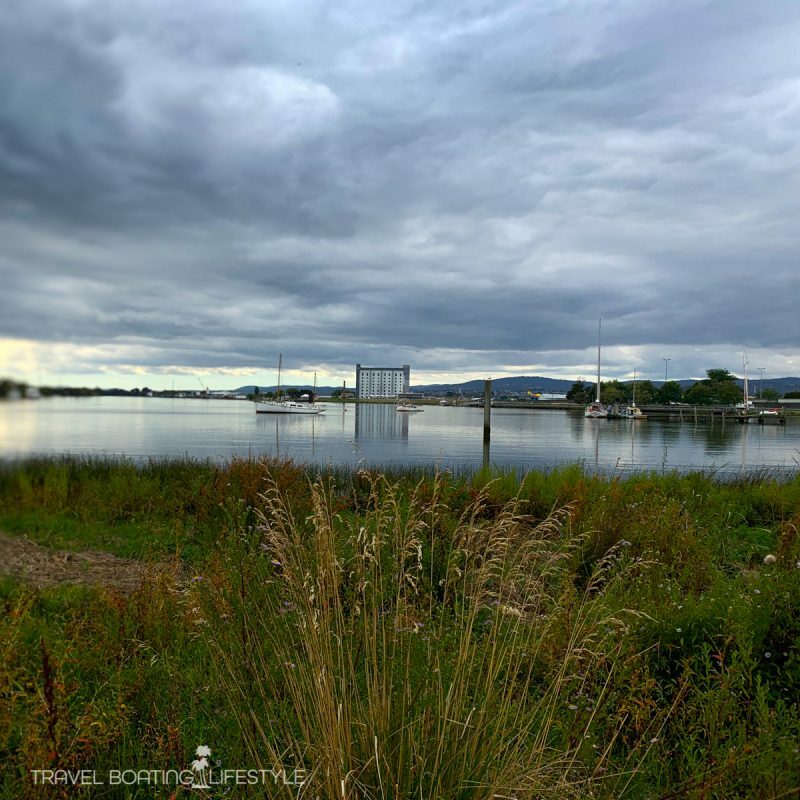 Due for completion mid-2019, once established, this will only add to the appeal of Peppers Silo Hotel, particularly for families with an enormous park a few steps from the hotel. Here’s Archie hard at work again. As the resident hotel hound, one of Arhcie’s tasks is to take guests for walks around the river. Sure, they might they think they’re taking him for a walk, but Archie is nobody’s fool. He knows the local haunts and will happily lead guests astray as he sniffs his way around the Tamar River. With plastic doggy-do bags attached to his lead, Archie will expect you to pick up any deposits he may leave behind – sure proof of who is running this show! 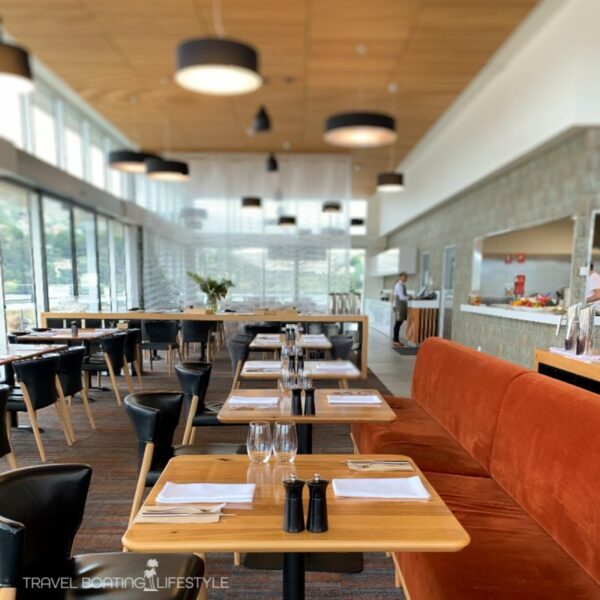 NOTE: Fiona Harper travelled as a guest of Tourism Tasmania and Peppers Silo Hotel Launceston.